Pretty straightforward section, follow the Snoqualmie Valley Trail along Cedar Falls Road. When you see signs for the lake, stay along the road, not the trail to the lake. 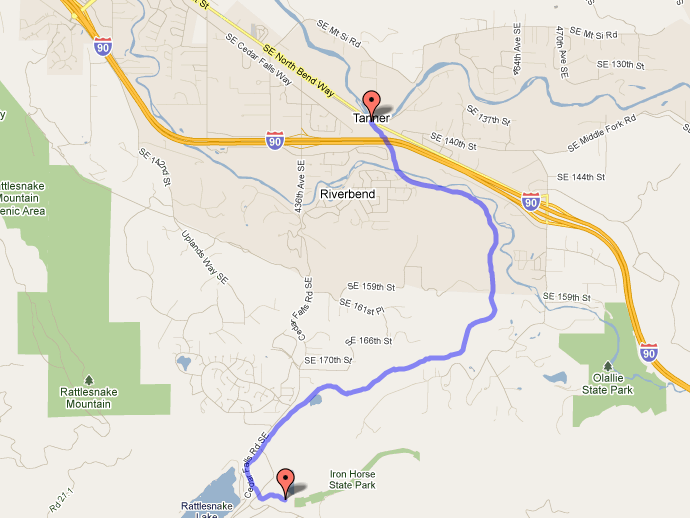 Cut across the forest road and onto the John Wayne Trail. From there you will come to a junction with a detailed sign, make a left (west). From here you follow the John Wayne Trail over the mountains. Click here for Section 5, a detailed look at the John Wayne trail portion of the route, over the Cascade Mountains via Snoqualmie Pass.